BRAND NEW ITEM! SugarVeil AirPen Piping Dispenser at KEREKES BakeDeco (coupon not needed)! Comments Off on BRAND NEW ITEM! 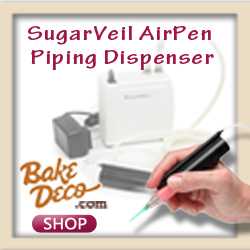 SugarVeil AirPen Piping Dispenser at KEREKES BakeDeco (coupon not needed)! For those of you looking for the fabulous SugarVeil AirPen Piping Dispenser, it’s right here at Kerekes BakeDeco for only $209.95, and no coupon code is necessary to get this price! It is IN STOCK, and this item qualifies for Kerekes free shipping too! Check out the SugarVeil AirPen Piping Dispenser here. One of the features that we think you’ll like about this is that you won’t have nearly the hand fatigue that you might have when you’re dispensing icing from a bag – a great help for people with repetitive motion injuries! So, this can help you streamline your cake decorating efforts in a big way. Check out the specifications here (or click the photo to the right). If you’d like to see the SugarVeil AirPen Piping Dispenser video demonstration, we’ve included it here (just below) for your convenience. You can use ANY icing, including royal icing and buttercreams – if using buttercreams, it is suggested that you let it be a little warm so it will flow easily. You can add your own colors like always. If you are looking for a cake decorating tool that gives you the opportunity to create exceptionally fine details, you will love this tool. OH! One person also uses it for her crafts and painting on silk! Who would have thought of that! What a versatile tool. Buy the SugarVeil AirPen Piping Dispenser Here.